Nokia has launched 3GB RAM variant of Nokia 5 Android Smartphone in India Priced at Rs 13,499 available on Flipkart starting tonight. 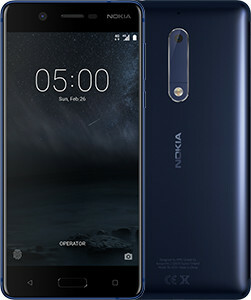 Nokia 5 feature metal body It has a 5.2-inch (1280 x 720 pixels) 2.5D curved glass HD Display powered by 1.4GHz Qualcomm Snapdragon 430 processor coupled with 3GB RAM and 16GB of internal storage which is further expandable with MicroSD card up to 128GB. on camera, it has a 13MP rear camera with dual-tone LED flash, 8MP wide-angle front camera. Dual SIM Phone runs on Android 7.1.1. Nougat and will be upgradable to Android O.Connectiivty options include 4G VoLTE, WiFi 802.11 b/g/n, Bluetooth 4.1, GPS, USB OTG. Packed with a 3000mAh Battery. Nokia 5 also comes with Fingerprint Scanner on the Home Button. Nokia 5 comes in Matte Black, Tempered Blue priced at Rs.13499, 2GB RAM model cost Rs 12,899.